Will I meet my main walker/sitter? Generally, yes! With family business Ditmas Paws, you will never have to worry about a large roster of “strangers” showing up at your house. Our team currently consists of 4 caregivers, Kena, Kopyrh, Ash, & Rachel. You will meet one or two of us during the initial meet & greet. If you are setting up a M-F walk schedule, you will be assigned a “main” walker and they will be your pet’s primary caregiver. In the event they are unavailable or your schedule is less predictable, your walker/sitter will be determined based on our location and availability. Although you may not meet all 4 of us at the meet & greet, you can rest assured that our small team of experienced pet-caregivers works together very closely, we value consistency and long-term dedication–so there will never be a high turnover rate of our walkers/sitters. Please check out our “ABOUT” section to put faces to names and learn more about our team. How will I know the visit was completed? Your walker/sitter will send you a summary of the visit after we complete it. You can view history of all messages/summaries from your personal online account, and you will also receive an email copy as soon as the summary is sent. A cute little “report card” checklist is included as well. This update will include time & date, bathroom & behavior information, and anything else worth mentioning about your beloved pet. If you’d like, we can even send you a photo! Yes! We are proud members of AND fully insured by Pet Sitters Associates. Which neighborhoods do you service? We are proud to be based on Albemarle Road. We provide service to all Flatbush neighborhoods, mainly Ditmas Park, but also including Prospect Park South, the Beverley Squares, Fiske Terrace, Victorian Flatbush, and some parts of Prospect Lefferts Gardens and Kensington. What is your availability? How can I schedule a visit? Booking visits is super simple and quick with our online scheduling system. At our meet & greet, we will provide you with a personal & secure account to login to, from there you can request services, keep your information up-to-date, communicate with your designated walker/sitter, and view/pay invoices. We are pretty flexible and though we are consistently busy, we will always do our best to accommodate you when possible. To ensure each pet gets the best care, we cannot take on additional visits once our schedules are full. It is recommended that you request your visit as soon as you think you may need a visit, as we do book up and last minute requests cannot be guaranteed. We do indeed work on Holidays! Our holiday schedules are set by request only. For dog walking, we “clear the schedule” for all national holidays, and you have the option to request a visit if needed. If your request a visit in advance, we are likely able to accommodate. Because our holidays fill up with petsitting in advance, it is unlikely that we can take any last minute holiday requests, so please get your requests in as soon as possible. Please note there is a $10 surcharge for all national holiday visits. Yes! We can give your pet medications & supplements as per your vets instructions. Pill pocket & food mix-in type meds are given at no additional cost. Injections and oral meds are subject to additional charge. Do you work with aggressive pets? We work with many different temperaments, including dogs with leash aggression, fear aggression, dog aggression. We will work with your pet to help them stay calm and avoid any triggers. We will always openly communicate about your pet’s behavior, as well as help reinforce any training techniques you may use at home. However, in extreme cases, (such as a dog’s aggression interfering with our ability to walk them, or posing a threat to our safety) we do recommend that you consult a trainer before continuing dog-walking services. While we walk your dog, we use positive reinforcement training techniques. We can also use the commands, signals, and techniques that you/your trainer use, for added consistency. During our puppy routine visits, we work on basic obedience training (sit, stay, down, come, heel, etc.) However, we are not certified trainers, but we can recommend some! How does a "group walk" work? We offer a wonderful option for your pup to walk in a small group or “pack” with neighbor dogs. This is a great way for your dog to socialize and get to see their nearby friends. It is a common misconception that your dog may not get enough attention during a group walk, but with years of experience we have found that with a maximum of 3-4 dogs (depending on size, ie. 2 large dogs, or 3 medium, or 3 small), everyone gets the attention & opportunities to sniff and use the bathroom that they need. Many dogs actually walk BETTER with other dogs, because they are pack animals, they tend to fall nicely into line and develop their manners and social skills. We NEVER tie dogs up outside, when we pick up/drop off your dog’s friends, all dogs dogs wait (within view) in the inside entry way, safe & secure. We offer this as an option, at the request of the owner and based on location and compatibility of dogs. We also don’t charge more for individual walks, so its up to you! Do you have references from clients? Of course! We take pride in the high quality of our work, and the proof is in the positive feedback our clients have shared. We are on social rating sites such as yelp, google+, and facebook (scroll to bottom of page for links), but we also have our very own “testimonials” page where our clients can submit their own references and reviews of our service for you to check out. Who designed your logo & this website? 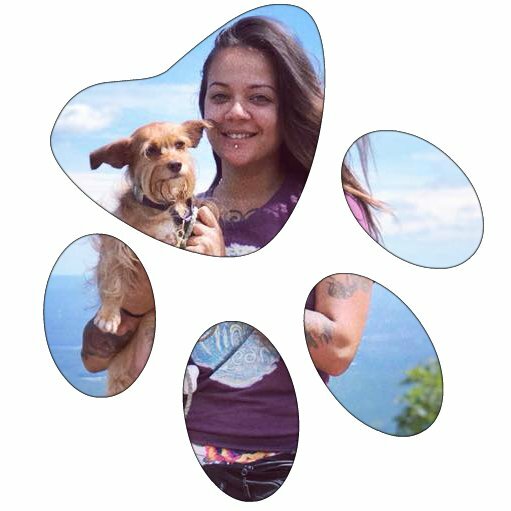 Our painted pawprint logo and this website was created by Ditmas Paws founder, Kena, as well as working with pets, she loves art and design, and enjoys dabbling in web design as a hobby.